Union Township Veteran’s Memorial Park, aka The Helicopter Park, is conveniently located at 906 Clough Pike, Cincinnati, OH, 45245, one of the busiest intersections in the Eastgate area, making it an easy place to stop for a quick walk, but not necessarily a nature walk. We were pleasantly surprised, however, as we discovered some unexpected treasures along the path, and left feeling refreshed by a brief commune with nature. 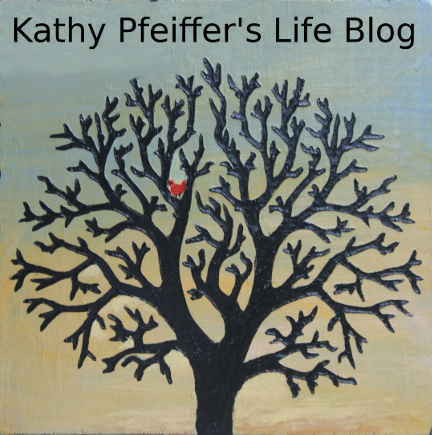 We walked the trail on Sunday, Feb. 7, 2016, at 11:30 a.m. The temperature was 42 degrees, with a slight breeze. Even though the park is filled with amenities, like playgrounds, a basketball court, and shelters, the cold temperature kept people away, and we were one of very few small groups. 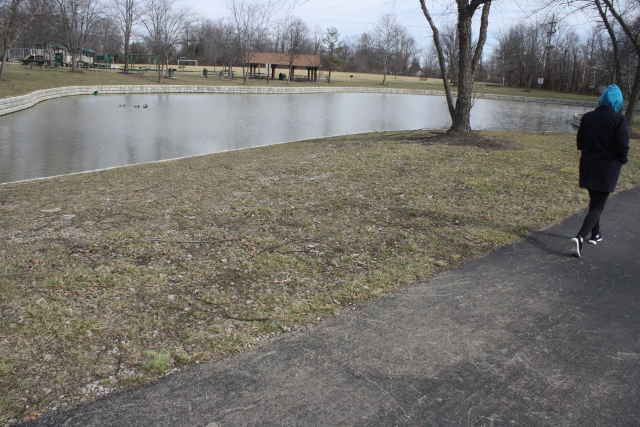 The paved walking trail is flat, in excellent condition, and surrounds the amenities, including fields for playing baseball and a pond. If you start walking at the front of the parking lot, you can gauge your walking distance by markings on the path showing several distance points until reaching a mile as the path circles back to the beginning. Near the beginning of the path is the Veteran’s Memorial area with a Vietnam era helicopter, which was an interesting distraction from the heavy traffic on the road beside it. Two sides of the square-shaped park run along the road, and fortunately the other two sides are beside wooded areas. Soon after passing the memorial area, there is a lovely pond with benches, ducks, and geese. It was soothing to look at, and marked the turn in the path away from the road. Walking along this far side of the park is where we finally felt a connection with nature, even on this cold February day. 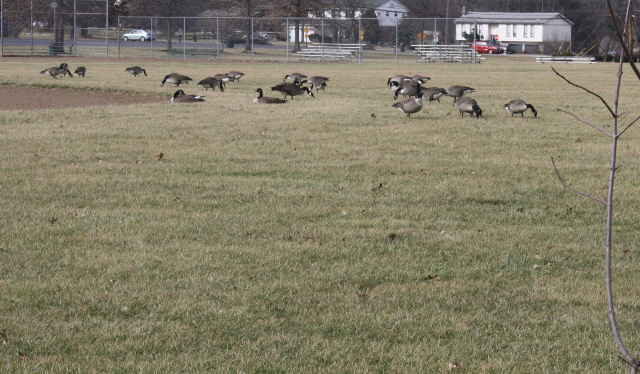 Besides hearing song birds in the woods beside the trail, the ducks and geese had gathered on the baseball fields near the trail, making it feel like you were in a bird sanctuary. 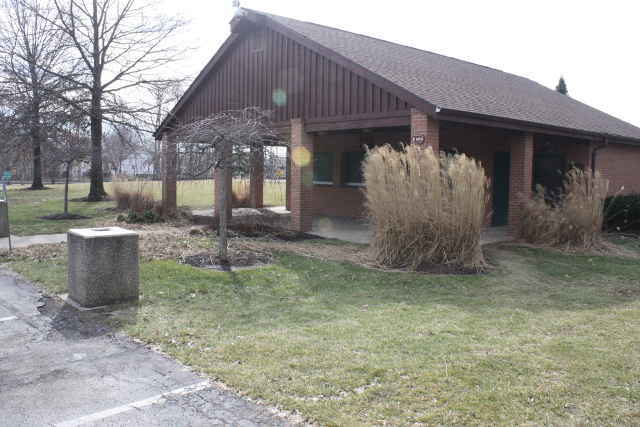 Restrooms: There was a men’s and women’s restroom in a brick building at the center of the park. They were open and heated, clean and nice. Traffic Noise: Heavy traffic noise. It’s better on the far side of the park, but you can see and hear traffic continually. Interesting Features: It has a great combination of sports features like tennis courts, exercise stations, and shelters available to rent, together with features like a pond and wildlife. You get a little of both urban parks and nature parks. 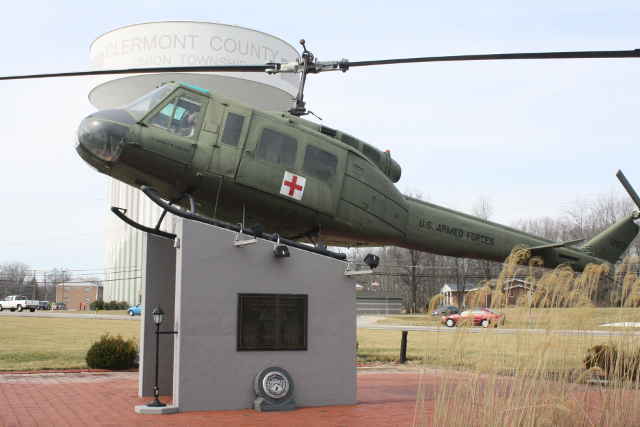 Historic Point of Interest: The park memorial is dedicated to the people of Clermont County who had served in the Vietnam War. This memorial is crowned by a surplus Huey helicopter that had actually flown combat missions in the war. Lt. Andrew Haglage’s name is inscribed on the helicopter. The 25 year old resident of Batavia, Ohio, was a Marine Corps pilot killed in 1969 while flying his helicopter in Vietnam. Overall Rating: We can’t promise you a quiet nature walk on a warmer day when the park is filled with people enjoying the amenities, but we can promise you a pleasant walk in a convenient park, making your weekend outing easy and fun, a walk in the park! So interesting with the Haglage connection.